Jörg Sasse - Jörg Sasse: "Failure"
1) If there is not a good light source indoors, then take the photos outdoors. 2) Here's the rule for outside: a cloudy sky provides outstanding light for taking clear pictures of subjects, because the light will illuminate all visible sides of the subject evenly. This, along with the firm resolve to fix the distance between lens and subject with the greatest possible precision, nearly takes up all of the novice's time: it is compounded by the absence of any experience whatsoever, generating a certain agitation to top things off. After all, in a situation like this, the objective is to keep the gap between the outcome one imagines and the actual result of one's efforts as narrow as possible. The evaluation of lighting conditions indoors was followed by the decision to photograph the object of interest in the daylight. Situated closest to the house was the terrace, the floor surface of which had only recently been renovated with very modern, rough-textured concrete slabs. Why I decided to photograph the toy car from a diagonal angle, I can no longer recall. But I have a clear recollection of the first problem: photographing the subject so as to fill out the format involved would have required a distance setting, which was impossible to obtain. The excitement and curiosity over the result did not, however, permit me to keep my eyes peeled for other subjects. The first compromise was accepted: the picture should be taken from the shortest distance setting possible. 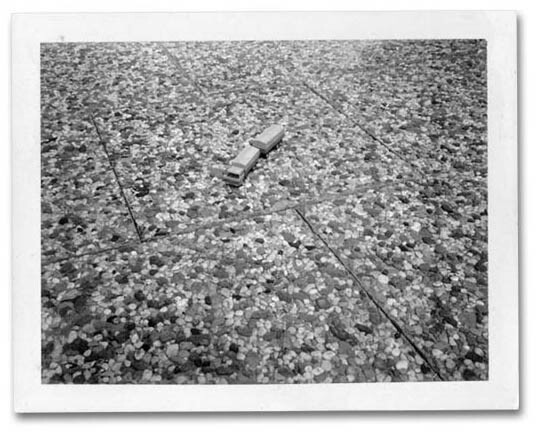 I recall that a measuring tape was enlisted to arrive at the precise setting so as to better determine the camera's approximate position. There was no additional equipment available, such as a tripod or the like. The subject to be photographed was hastily placed in the middle of the viewfinder, the breath was then held in order to squeeze the long plastic release all the way through? Breathe? The shot was in the can. The Polaroid had to be held suspended from an extra-sturdy plastic strap in order to withdraw the latent picture evenly from the film pack within the camera. Now it was necessary to allow the chemicals that had thus been discharged across the picture the time they needed. Measured in terms of a child's life up until that point, a minute is a remarkable period indeed. Finally, remove the exposure from the Polaroid carrier. This was accompanied by a pungent odor surpassed only by the additional use of the fixing stick that came with the camera. If the procedure was carried out meticulously, enlistment of this pink-colored stick treated the user to a reasonably high-gloss surface on the black-and-white photo. Yet for all the joy over the technological capability of having made a photograph all by oneself, the result remained a disappointing one. Aside from the anticipated small representation of the subject, something entirely unexpected had taken place. Despite its central position, the so highly prized toy car shown in the two-dimensional photo had lost its entire presence. The rough-textured concrete, meant to provide a neutral background, turned out to be more significant than the intended subject. In terms of the expectation involved, the photo had been a failure that for me as a child, in spite of my joy over the technological achievement, left me unsatisfied. A second attempt with the same motif did nothing to change this. The dimension of failure and thus its potential remained hidden from me at the time. Beyond technique and concept, amazement conceals itself in the visual. Even in the absence of the image conceived, even when the 'intention' is missed, the visual is present. Seeing the visual is the beginning of the infinite potential of images.